Stephen Baxter is one of those science fiction writers with the background (mathematics) to back it up. He writes what some might call “hard” science fiction, putting a lot more emphasis on the science than on the fiction. And that’s OK. I only state that to give you a heads up for what to expect. 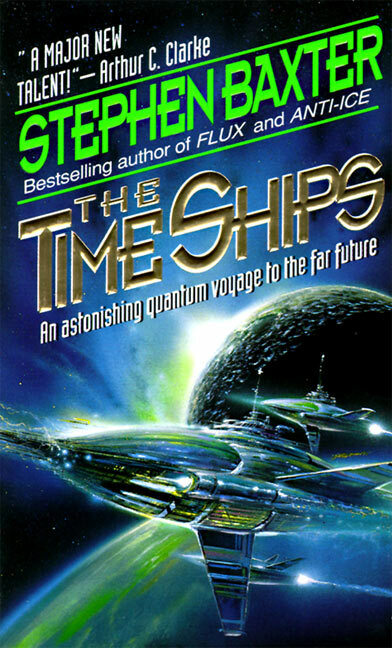 The Time Ships is presented as a sequel to The Time Machine by H. G. Wells, using all of the same characters and storyline as in the original. That’s probably what first intrigued me about the book. He starts the story right after the main character has returned to 1897 from the age of the Morlocks and Eloi, and is intent on going back to rescue his love of the far future, Weena. What he discovers is the principle that instead of changing history, every action we take has the effect of creating alternate realities. He travels to a distant future that is vastly different than the one he left. One caveat: because he deals with the far future and very distant past–including going back all the way to the beginning–there are a lot of references to evolution in the story. In addition, as I mentioned earlier, Baxter is a scientist who writes hard science fiction. His treatment of God and belief is what one would expect from someone who puts science ahead of religion. The story doesn’t have a lot of conflict–internal or external–and with the exception of the main character, not a lot of character development. Instead, probably similar to the original, it is caught up in the wonder of describing the many worlds that he discovers. There is much reference–as was in the original–to man’s inability to escape from his own violent tendencies, and war seems the inevitable result in many of the histories he explores. The book is thick–520 pages–and he takes advantage of that length to be thorough in not only a multitude of possible histories, but their implications on the nature of mankind. It wasn’t the most entertaining book I have read recently, but I found it fascinating nevertheless. I give it four (out of five) stars.